Discover our Zen chests of drawers in solid lamellar beechwood. They are available in many different colors and sizes. For custom made pieces, contact us for a price quote and specify the dimensions you need. Zen Space-Saver Chest of Drawers 1'11"
Zen Chest of Drawers 2'11"
Thanks to its minimalistic design the Zen Compact Chest of Drawers matches perfectly with our Japanese beds and wardrobes. This chest made of 26 mm thick lamellar beechwood is 90 cm wide, 80 cm high and has 4 drawers. In the options below you will find a variety of dimensions and wood surfaces to compose your own personal model of choice. Zen Chest of Drawers 3'11"
The Zen Standard Chest of Drawers in 26 mm thick solid lamellar beechwood adds the final touch to complete your bedroom. This model in minimalistic style is 120 cm wide and 80 cm high. There are lateral millings for an easy opening of the 4 drawers. 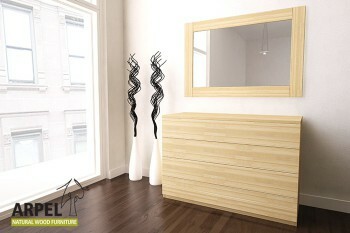 Zen Chest of Drawers 5'3"
Complete your Japanese style bedroom with the Zen Plus Chest of Drawers. This model with 8 spacious drawers is made of 26 mm thick lamellar beechwood and it is 80 cm high and 160 cm wide. You can choose your favorite color among our selection of water-based ecologic finishes. Zen Chest of Drawers 5'11"
The Zen Maxi Chest of Drawers in 26 cm thick solid lamellar beechwood transforms your bedroom in a tidy and harmonious ambience. This model has 8 drawers and is 80 cm high and 180 cm wide. In the options below you will find a variety of choices of dimensions and water-based ecologic finishes to create your own individual model.